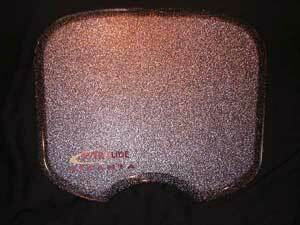 The transparent Everglide Attack Pad Optical and Giganta Optical Pads are made of a polystyrene thermoplastic. They are about 6mm thick, with small-rubberised feet mounted on the bottom, which means they sit about 8mm high. They remain the same shape and size as the ‘original’ Everglide Attack Pad’s and Giganta’s (270 x 210mm curved-almost-oval shape for the Attack Pad and an almost-rectangular 290 x 250mm for the Giganta). The bottom of each of the Everglide Optical mouse mats has a concave indent, and many people have commented that this makes for more comfortable mousing. As I mentioned earlier, I used my Everglide wrist rest, and this indent was designed specifically for the Everglide wrist rest, increasing the comfort factor even more. The sides of the Everglide Optical’s have a rounded and smoothed surface, so there are no sharp edges to catch your mouse cord or wrist. The edges of the mouse mats have a very gradual curve, and are about 15mm wide, to me this seemed excessive, and especially for the Attack Pad, I would have rather seen more real estate devoted to the mousing surface. 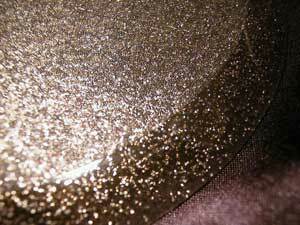 The mousing surface of the Attack and Giganta Pads has a bumpy-matte finish. The gradually rounded edges of the Everglide Optical Smoke. A press release from Everglide indicates that the mousing surface is made from a “Patent Pending FineCell(r) texture”, that it has a “texture consistent across the entire surface of the pad” and additionally “more densely articulated texture with a steeper vertical wall giving it a more acute drag coefficient.” I’ll let the PR managers or material-engineers decipher all that, and just give my impressions of how the mousing surface was to use. When I first received the Everglide mouse mats, my PC was recovering from a faulty hard drive, and was turned off. But that didn’t stop me comparing the Everglide to my Ratpadz. 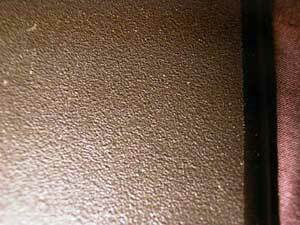 The Ratpadz surface – which I have been using for several years now – is made from a number of small and relatively smooth bumps, this allows the mouse to glide almost silk-like across the surface of the Ratpadz. The Everglide surface, on the other hand, has a large number of steep-sided small bumps and miniature canyons. The almost-rough texture of the Everglide Optical mats is quite noticeable - especially when rolling the mouse from one side of the mouse mat to the other, in a non-turned-on-PC situation. Close up of the Ratpadz mousing surface. Close up of the Everglide mousing surface. 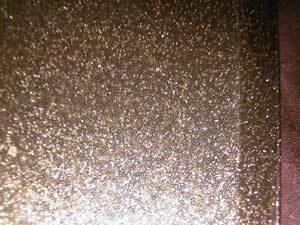 The textured Everglide Optical mousing surface is also quite noisy; my girlfriend’s lightweight MS Optical mouse is noticeably louder when using the Everglide mouse mat – as compared to using the desk surface which she did before. The noise when using the mouse should not really be a negative factor, and is barely louder than the variety of fans that many people have adorning their PC’s. The noise was also less noticeable with my heavier (or heavy handed) MS Explorer mouse. At first I was concerned about the almost-rough surface, but after using the Giganta Optical for a number of days, the increase in texture – and friction – is now quite comfortable. While it does take a slight increase in effort to slide the mouse over the mat, accurate mousing is now much easier. Generally most mousing does not involve rolling the mouse from one side of the mouse mat to the other, but rather placing the mouse in specific locations – especially when playing one of the many FPS games which are hugely popular – and the Everglide Optical’s surface makes this very easy to do. If I were to spend all day flinging the mouse from one side of the mouse mat to the other, I would most certainly prefer the smoother (possibly worn) surface of my Ratpadz. But for general accurate mousing – especially important for games – I find the textured surface of the Everglide Optical much more useful. You’ll notice that I mentioned using the Giganta for several days, I did use the Attack Pad – for a number of hours – however, I found that for my mousing style, it was simply too small. I generally rest my wrist on the wrist rest, with the heel of my hand close to the bottom of the mouse mat – just above the curved bottom of the Everglide. When using my MS Explorer in this situation, I found that the feet of the mouse often slipped over the top or side edges of the smaller Attack Pad. No doubt the Attack Pad would be good for anyone who has a smaller desk, or little room for a mouse mat, but my preference went to the Giganta.